Rough-barked apple trees and furrowed ironbarks are dotted across the grassy slope rolling down to a lazy river. This could be some manicured estate or a city park stretching away before us except, there is a rough, wild edge to it and an uncanny silence. We wander through the sleepy bushland in the rising heat of an early summer's day. The walking is easy, the river shallow and sandy. Simple to crisscross when need be. 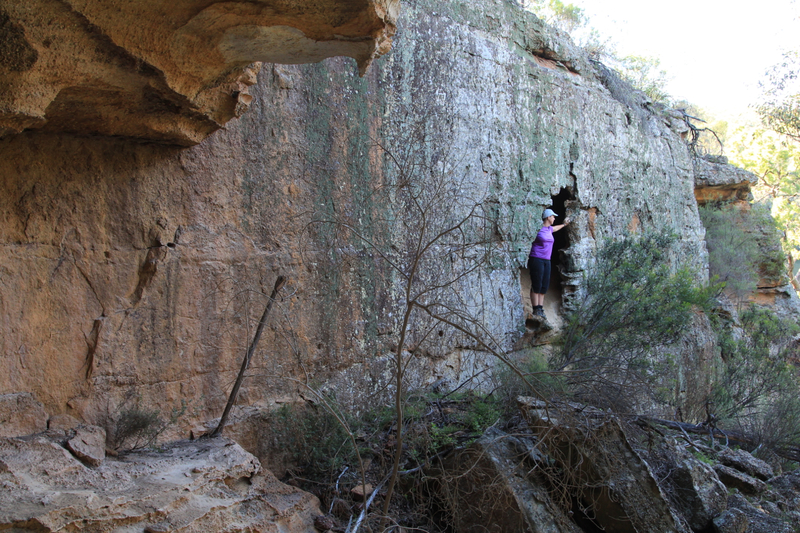 Sandstone cliffs tower above us, honeycombed with caves and shelters. There are goannas, kangaroos, turtles, fish and mussels. It is a landscape that feels like a home; a place to dwell in, live off, travel through. "At each bend you expect to see the smoke of camp-fires drifting up from the valley" says Peter Wright in his opening description of Goulburn River National Park for his book The NPA Guide to National Parks of Northern NSW. 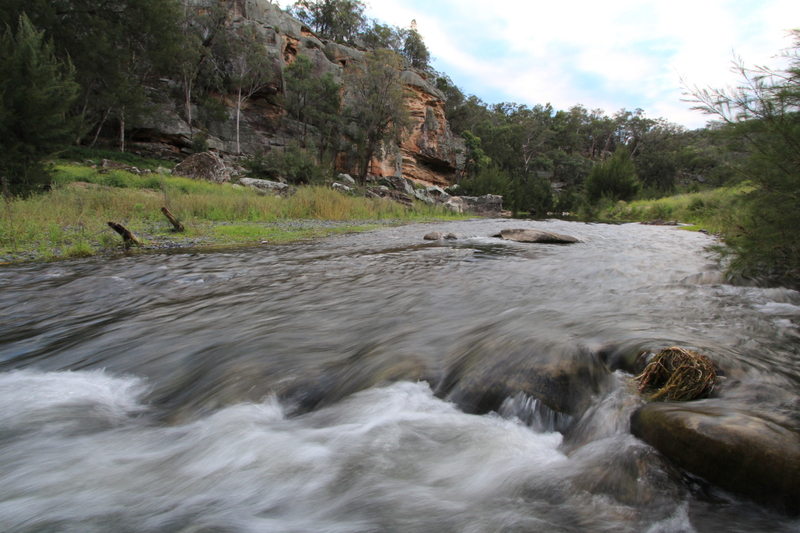 It is easy to conjure up this river's past as a busy Aboriginal trading route and Wright laments this vanished past: "Walking along the Goulburn River valley is like visiting an Aboriginal ghost town." Voyeurs. We are here simply to have a look around but it is the landscape's intrinsic beauty that has drawn us here. That, and the fact that river walking is a favourite summer past-time. We start at Spring Gully Campground, a peaceful open grassy site with basic facilities, dozens of roos and a few wombat holes that seem quiet but not abandoned. We cross the river below the campground and then 500m downstream we cross again. 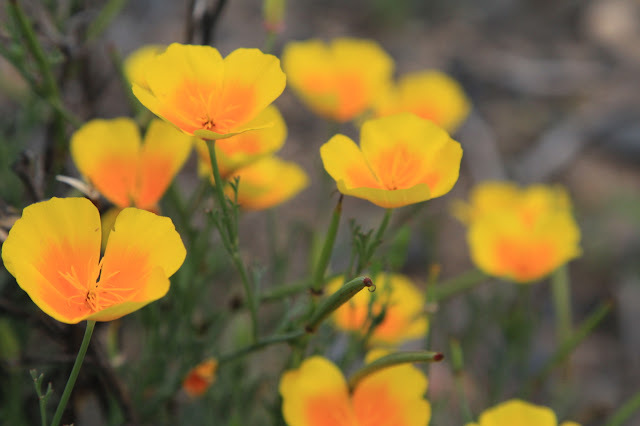 Beside the river, the banks are thick with weeds – mainly thistle and Mexican poppy, some stinging nettle and stinking roger but also Californian poppies in summer bloom. After the second crossing we stay river right following some sandy shoals. By 10:30am it is pretty warm; creeping steadily toward the forecast maximum of 36 degrees celcius. The heat brings out the usual suspects and in a dense section of weeds a black strike of snake flashes beneath my boot. It is a breathtaking moment – the closest I have ever come to standing on something so alive and dangerous. We stop. It is time to play it safe and slip on our gaiters. 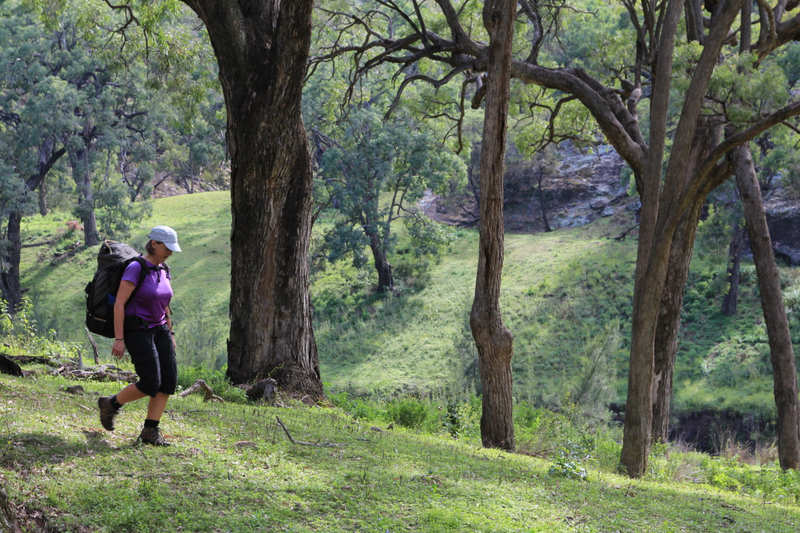 For us, this is another of those walks that could easily be done in a day but which we choose to stretch out into an overnight escape – wandering as far down the Goulburn River as we care, finding a pleasant spot to camp overnight, pretending we are in fact at home and living in this landscape. As I walk I also lament the place's lost past of habitation and thousands of years of history, but moreso I regret that living here is only our brief present, not our future. We have just a weekend to spare, but this lovely valley could keep us happy, sheltered, fed and watered forever. 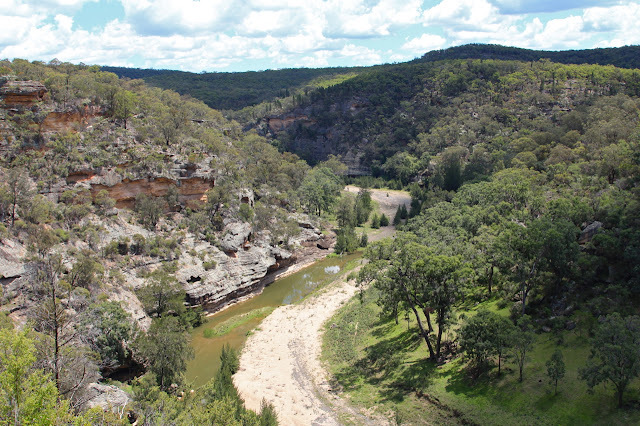 Located between Mudgee and Sandy Hollow in NSW, approximately 300 kilometres north-west of Sydney, much of what is now Goulburn River National Park was proposed to be flooded in the early 1980s as part of the proposed Kerrabee Dam, which was to supply water to the Hunter Valley. However, following extensive environmental assessment, it was decided that the area’s natural and cultural values were too great to lose and the area was reserved as a National Park in 1983. The "significant natural and cultural values" of the park include a total of 343 sites that provide evidence of Aboriginal peoples living in this landscape. 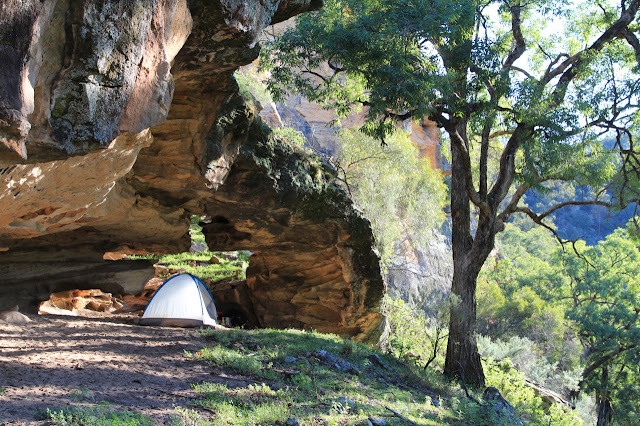 There are artefact scatters, rock art, camp sites, axe grinding grooves, and ceremonial carved trees within lands traditionally occupied by Aboriginal people of the Wiradjuri, Gamileroi and Wonnarua language groups. This richness of sites is thought to be related to the use of the river valley as a major trading route between the coast and the western plains and once we start walking it is easy to see this river as a popular and busy place. The hills above the river are broken by dramatic sandstone cliffs and bluffs. 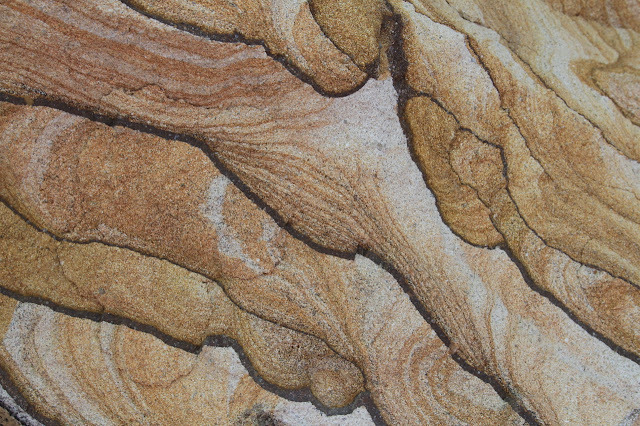 A couple of times we detour up high to have a closer look at the swirled and striped patterns in the beautiful rocks. To avoid one stretch of thick, tall thistles we sidle up onto a ledge of rock just above a deeper pool, the colour of jersey caramels. Floating there, along the edge, are small turtles. Given the time of year we take them for babies and they swim lazily among the reeds and floating algae. For lunch we use one of the many overhangs as a shady picnic site. It is right at water level and the dusty floor is marked with the distinct tracks of a goanna. It must be a favourite haunt, because 15 minutes later we see it coming - swaggering along the edge of the river, sniffing the sand, searching for turtle eggs. The goanna is a master of stealth. It disappears amongst the grass then just minutes later appears suddenly quite close at the water's edge. Finally it spots us, or hears us, or tastes us on the air. Taking fright it swims across the river. After lunch, we follow. Another two quick river crossings and we can tell by the dramatic cliffs that we are getting close to the section of river that lies near Lee's Pinch Lookout walking track (the only developed walking track in the park, a 1km loop). If we had a second car this would have been an ideal spot to leave one vehicle to turn our "out and back" adventure into a one-way overnight exploration. This lower section of the river is certainly more dramatic, with steeper sides and higher cliffs pressed much closer together. As we have no specific destination in mind we begin looking for a camp spot. A hot afternoon lies ahead and already we are sweaty and dusty and ready for a swim. And, it's a cracker of a cave that we settle on. With a flat, dusty floor it is high enough to stand up in and overhung enough to keep off any overnight dew and although on the wrong side of the river to get early shade it has a western wall that protect us from direct sun all afternoon. It is high off the river with pleasant views. We scramble up the cliffs above our new home until we are looking down on the valley and the old trading route winding away in both directions. The riverside landscape, with its well-spaced trees and open grassy terraces, reminds me of the theories, arguments and evidence presented a few years ago by historian Bill Gammage in his excellent book "The Biggest Estate on Earth" in which he argues that prior to 1788 the Australian landscape reflected a sophisticated and sensitive farming regime integrated across the Australian landmass using fire as the main agricultural tool to ensure certain plants and animals flourished and to ensure resources were convenient and predictable. He argues this use of fire resulted in a landscape that the early settlers repeatedly described as "park-like", looking similar to the manicured and planned private estates in England. The Biggest Estate on Earth is a fascinating read and the landscape of the Goulburn River is a haunting trace of this heritage. Leaving our cave home in the morning is regretful. We sit quietly for a long time, watching butterflies tumble across the grass. White cockatoos blare out their flight warnings and dodge invisible bullets as they head down the valley. It is overcast and cool. I watch the opposite bank hopefully, thinking the early morning gloom might tempt a wombat to stay out longer. The big burrows I can see, dug into the slope, are still. For the walk back to Spring Gully campground we stay on river left, where on the way down we walked predominantly river right. The landscape is similar though, more of those park-like groves of ironbark and apple. As we make our way around a long bend in the river a massive male Wallaroo, feeding on the low-cropped lawn, is startled by our approach. Its sheer size and bulk make it seem less hurried in its escape than the usual wallabies and kangaroos we've seen. It has black, shaggy fur, stands at least 2m tall and is built like a brick shithouse with a muscular chest and forearms and solid haunches. It bounds off, up to the rocks and cliffs higher on the slope, where it hopes we cannot follow. By persisting on one side of the river we end up running out of bank. 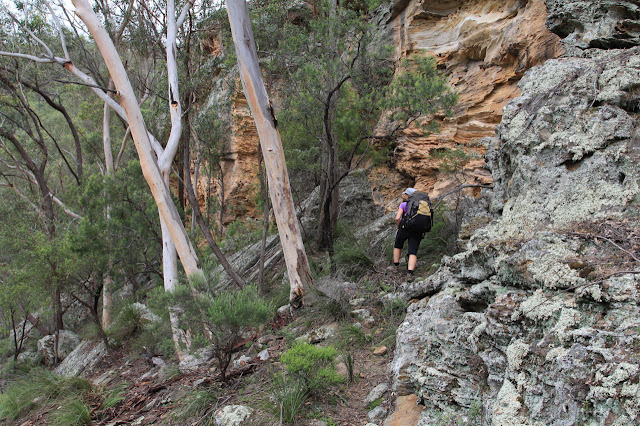 Forced to backtrack, and find a route up high through the cliffs and rocks like the wallaroo, it makes for more challenging and interesting walking. Up high amongst the rocks we also found large numbers of geebung trees flowering - some densely covered in their bright yellow flowers. Once we had spotted one tree, suddenly our eyes saw the hillsides covered in them. This, to me, is always the beauty of bushwalkin; the way you discover things in a landscape. It is an intimate way of travelling. I find things as I walk and each discovery makes me feel more at home. Like getting to know a new friend. And while we have our backpack filled with food and clothes and while we have access to land that is vibrant with diversity, we will be at home wherever we walk. Another interesting and quality read guys and, something to add to the bucket list. I despair at times that blog writing in our 'community' seems to be dying but each of your blogs brings me renewed hope. Thanks Phil. Not quite sure what to say to such nice words but comments like yours keep us going. It is always a pleasure to write about some of the great places we visit. Thanks for reading. Visited The Drip at Goulburn R in October; a great place.